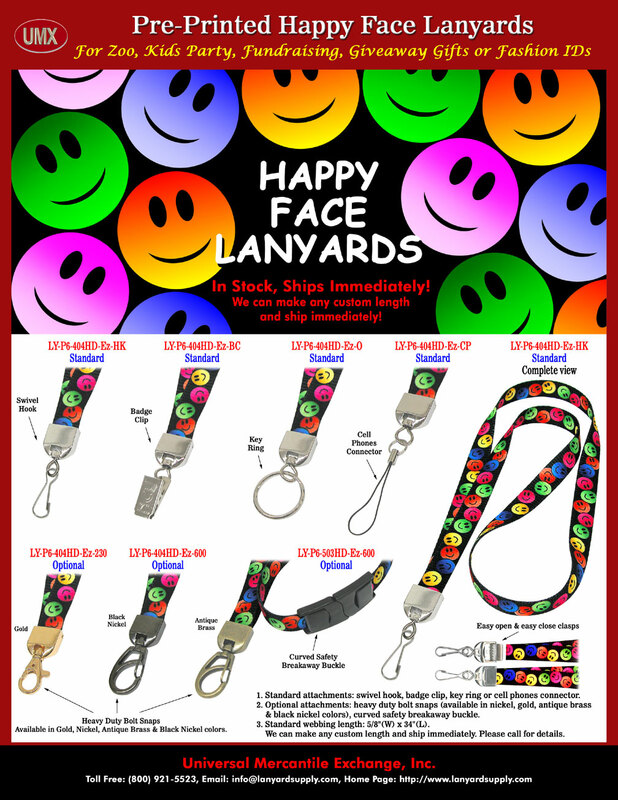 Happy Face Lanyards: Smiling Face Lanyards, Laughing, Smiley Faces and Funny Smile Face Printed Lanyards. Good For ID Name Badge Holders, Key Holders, Zoo, Kids Party, Fundraising, Promotional Giveaway or Gifts. Happy face lanyards are pre-printed lanyards with happy, smiling, laughing, smiley and funny smile faces. The happy faces or smiling face patterns are printed with dye-sublimated colors on both sides of the lanyards. Our standard happy face print lanyards come with heavy duty nickel color swivel hooks, badge clips, key rings, or cell phone connectors. Happy face print lanyards also come with a variety of optional hardware attachments, such as safety break-away buckles, heavy duty nickel color, gold, antique brass or black nickel color snap hooks. Happy face print lanyards are good for ID name badge holders, key holders, zoo's gift shop resale stores, kids party, school or events fundraising, promotional giveaway for events or conventions, as gifts, or as fashion name badges to wear. The happy face print lanyards with the cell phone attachment can be used to carry camera, cellular phone, USB flash memory cards, flash drives, CD, iPod or MP3 players, flash lights, small meters, and electronic devices etc. Please check our online catalogs for more cool lanyards with animal prints. Joy appeals: happy, laughing, smiling, smiley faces are important to your daily social life and your spirit. Laugh and Smile Your Way to Health - By Dr. Joseph Mercola with Rachael Droege. "Want a totally free, simple way to boost your spirits and your health with no prescription needed? Then you want to laugh and smile as much as possible. As simple as it sounds, laughing and smiling, in other words allowing yourself to get swept away with overall good humor, is beneficial to the cardiovascular system, respiratory system, muscular system, central nervous system and endocrine system." Just like our smiling face or happy face lanyards, there are a variety of other products on the market come with smiling faces such as pillows, bath towels, calendars, Christmas ornaments, ties, Valentine neckties, underwear, T-shirts, hats, cups, mug, blankets, jars, hand painted ceramic, clip arts, fabrics, photographs, web graphics, keychains, watches, necklaces, charms, clocks, aprons, posters, decorative accessory items and more. Smiling face lanyard is always a great gift to add one more smiling face. Specifications: Happy Face Lanyards: Smiling Face Lanyards, Laughing, Smiley Faces and Funny Smile Face Printed Lanyards - Gift Shops Supplies. 1. Standard Width of Happy Face Lanyards: 5/8". 4. Standard Colors of Webbing/Straps: Happy Face Prints. Optional: Any Pantone PMS colors with a minimum order of 5000 pieces or more. 7. Way of Pre-Printed Patterns: Dye sublimated on both sides with happy face prints. 8. Custom Imprinting: Use the happy face print patterns as back ground. Any customized or personalized logo printed on happy face lanyards available. Can be use as happy face print neck lanyards or happy face print wrist lanyards for ID name badges, dog leashes, tools holders and as shoulder straps for handbags, bags, or purses. You are viewing > Lanyards > Ez-Adjustable Neck Wear Models > Happy Face Lanyard: Smiling Face Lanyard, Laughing, Smiley Face and Funny Smile Face Printed Lanyard Supplies.